Help me. Please. It’s 3am and I’m leaning into the luminescent glow of my laptop screen like a moth to a flame. I’ve been sat, tense in my seat, for the past few hours – sucked in to the world of Thumper, a game unlike any other. I say this, but Thumper’s key aspects can be boiled down to a simple selection of mechanics recognisable to anyone who has played any videogames ever. It’s a rhythm action game – one that involves simple taps of the ‘A’ button to the beat of the backing track. From simple starts, more ‘moves’ are added, such as holding ‘A’ to turn corners or pulling the stick back to fly over certain obstacles. So far, so simple. Occasionally-appearing objects will deal ‘damage’ to the object loosely identified as your character – and taking 2 hits will force a restart of the level. The last piece of the puzzle is a scoring system, that grades you based on the number of beats hit, corners taken (at the ‘perfect’ time) and a pretty bonus for not taking any damage. So simple, yet so complex. 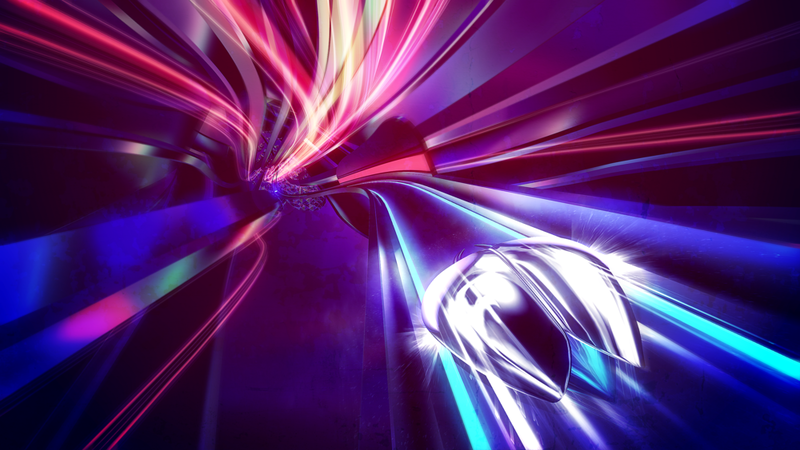 Thumper has possibly the most barebones gameplay system of anything I’ve played in recent memory, but it uses that gameplay system to its fullest extent, dressing it beautifully in neon and forcing you to play more. When the gameplay systems are laid out in front of you, Thumper sounds like a pretty chill, perhaps even relaxing, gameplay experience. Instead, it makes you feel something else entirely. Scared. Thumper creates an environment that a friend of mine observed as ‘real nasty’ – a statement that is both true and the reason I keep coming back for more. The music for Thumper is the beating (hah) heart of its gameplay – an incessantly rising electronic soundscape that is seemingly intruded upon by the pounding percussion of your inputs. Each obstacle on the ‘track’ will provoke a different industrial clang that weaves itself into the fabric of the foreboding synth lines that pulsate underneath. The ‘shephard tone’-esque constant rise of these backing tracks is perhaps what gives Thumper its hypnotic magic, each stage pulling you further and further down into its technicolour whirlpool. The stages in question create a general feel of exhaustion after playing a few; a taxing and menacing experience that is alleviated with small musical breaks. 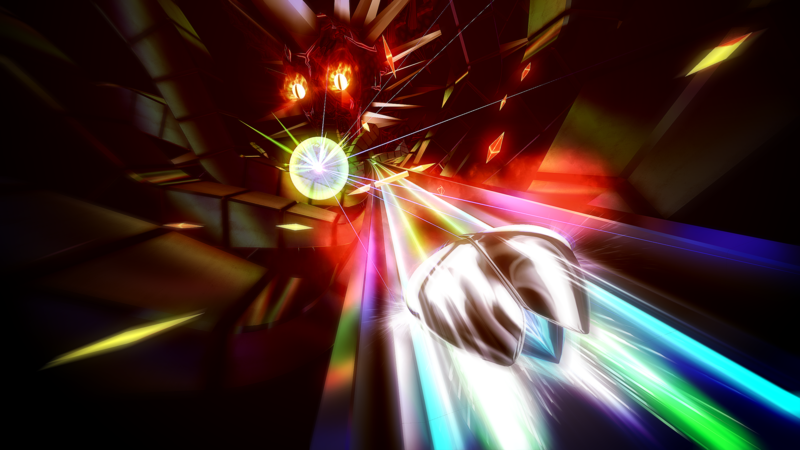 After a punishing stage, Thumper might reward you with 20 seconds to relax, ambient music glimmering in the background. Not for long though. You’re straight back into it soon enough. Only 20 more stages to go. Thumper is also a mean teacher. Whilst you may feel emotionally, physically and spiritually drained at the end of a particular stage (that you only just made through by the skin of your teeth), Thumper has absolutely no qualms with slapping a ‘C’ ranking on your performance and seemingly saying ‘better luck next time, kiddo – one day the void will swallow us all’. This demand for absolute perfection makes actually doing it feel gloriously satisfying, the visuals, music and actions all weaving together into something… weirdly zen-like? The double-edged sword of this is, of course, the fateful, cursory YouTube search for other, better players of Thumper, and watching, doe-eyed as they 100% every stage, shrugging off the challenges you only just made it through on your playthrough. There’s also the strange subcategory of people that choose to play Thumper in VR. Who? Why? Nobody knows. But they do it anyway. And by God does it look absolutely terrifying. Yikes.I’ve neglected to mention the small details of Thumper that can only really be explained through playing it – like the impending sense of dread when faced with the boss creature(s) in the game, or how every individual piece of player feedback just feels so good. But I’m being careful not to sing the praises of Thumper too loudly – because, similarly to Dragon Quest XI that I took a look at last time, Thumper is a game that I’d only recommend to people looking for a very specific kind of experience. Thumper is exactly that – an experience game – and one that doesn’t really fit into conventional genre descriptors and ‘if you like X, then try Y’-recommendations. There’s something about these sorts of alienating and otherworldly gaming experiences that keeps me coming back for more, and Thumper is a prime example of that, summed up in this neat-ish statement: ‘I can’t say I had fun with Thumper, but I did enjoy it’. The game exists in this crossed-wire transitory state in by brain where the satisfaction from finishing a level or acing an individual stage really pulls against the trials, tribulations and repetition that actually got me there. So, to close, I suppose Thumper is a great game for you if you like any (or all) of the following: a real challenge, feeling a bit sick, and noisy industrial soundscapes. Now, I’m off to go and get 100% completion. Thumper is out now on PS4 and PC.